The differences between those districts aren’t just economic, though. A principal difference lies in academics, and how students use their time at the districts high schools to earn college credit and further their education after graduation. “It helped me more, only because I was able to get out into college setting and get that extra preparation,” she says. At Anderson, she says, there were choices. She could choose her electives, her core classes, even the order in which she could take them. That wasn’t necessarily the case at LBJ, she says. Looking at Austin ISD data, few students are taking AP tests at three of the four high schools east of I 35, and those who are, aren’t scoring well enough to get college credit. Students at East Austin schools are taking dual credit courses through ACC. LBJ, along with Reagan and Travis high schools, are part of the school’s Early College Start Program. Here’s how the early college program works: students are tested to see if they’re considered ready for college-level work. If they pass, they can take college courses for free. If they earn enough credit, they can even graduate from high school with an associate’s degree. Richard Rhodes, president of Austin Community College says it provides students opportunities by providing them with an incentive. Research shows, if a student takes dual credit in high school, the chances they’ll go to college increase. Historically, low-income students have been shut out of Advanced Placement courses because of the cost of the test or lack of access. 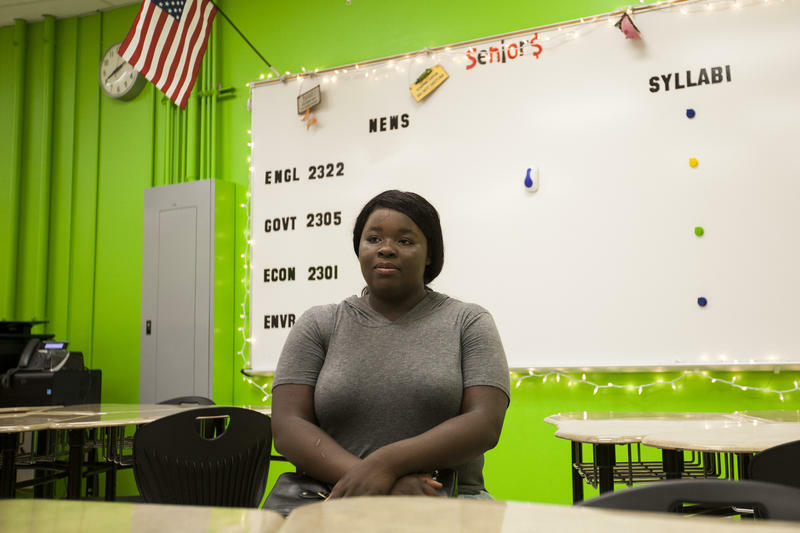 Nationally, the number of low-income students taking AP exams has increased over the past decade, but in many East Austin high schools, that lack of access to AP courses still exists. 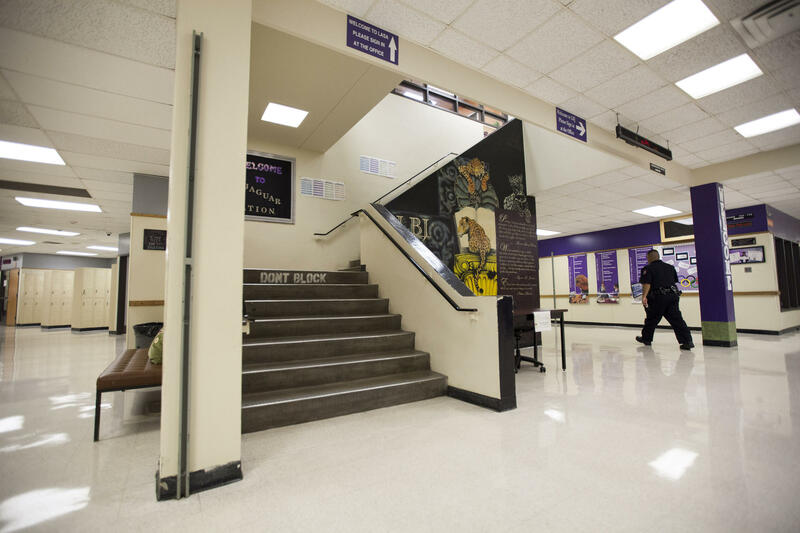 LBJ only offers four AP courses, compared to LASA, the magnet school in the same building, which offers 26 AP courses. You can explore AP courses across Austin ISD high schools below. As AP classes remain limited in some schools, students district-wide are taking more dual credit courses. “That’s really where you’ve seen the rise now in dual credit. Now, families realize the cost savings really translates into thousands and thousands dollars saved,” Oropez says. He says the imbalance in AP course offerings is partly historical: Some schools were designed around AP classes. But, the district tries to offer students as many course options as possible, and Oropez says that the offerings are determined by the needs of the families within district. Last year, the district started a student-sharing model where students could travel to different high schools to take courses not offered at their neighborhood school. But, Oropez says, low-income students are still leaning toward dual credit courses. “Because they don’t want to spend an entire year and have a bad day – you’re sick the day of test – and not get your college credit,” he says. Brenda Ortiz started taking AP courses during her freshman year at Austin High School. She took AP geography She did well in the class and was interested in the subject. And, while she studied hard, bought extra study guides and even attended Saturday classes, she still didn’t score well enough to get college credit. During her junior and senior year, she decided to take dual credit classes through Austin Community College instead. As a student who comes from a low-income family, Brenda liked that she was able to get college credit for free. She also liked that she had the whole semester to earn the credit– it didn’t come down to her score on a single test. Dual credit opportunities are increasingly popular district-wide and across the state. But, as these courses become more widespread, some, including Texas Higher Education Commissioner Raymond Paredes, are concerned the classes aren’t always as rigorous as they should be. Students must take a state test to prove they’re ready to take dual credit courses, but Paredes says there needs to be a some way to ensure the courses these students get credit for are actually college-level. Without some standard measure—like a test—he says there’s a risk those classes could become watered down. Paredes is also concerned there aren’t enough Texas students who are ready to do college work in high school. Paredes says, when he hears students at lower-performing schools are taking dual credit courses and not AP tests, it implies that dual credit courses aren’t as tough. And, if dual credit isn’t seen as rigorous as AP classes, that could affect student outcomes – like where they’re accepted to college, whether colleges will accept these credits, or how well they’ll do if they enroll. Rhodes, president of Austin Community College, says dual credit is better because it is a college class, not a high school class that prepares a student for college. But there isn’t a lot of local research that looks at how students who take AP or dual credit fare after high school graduation. Dual credit is so new that there’s not as much data. One group doing research in this field is the College Board, the company that administers the AP test. According to a 2008 College Board study, students in the AP program tend to have higher GPAs, earn more college credit and graduate college at a higher rate than students who do not. Trevor Packer of the College Board says those findings are even stronger for students on the low end of the spectrum, in terms of ability. On the other end, a study out of Florida found students who take any type of dual enrollment courses are more likely to go to college than students who take AP courses. But, they’re less likely to enroll in a four-year school. UT Austin and Texas State admissions officials say the colleges don’t weigh AP courses over dual enrollment courses during the admissions process. “[W]e desire and favor students who are maximizing their academic rigor while in high school and that can be demonstrated in a variety of different ways,” says Associate Director of Admissions at UT Michael Orr. But 60 to 70 percent of accepted students at UT come to the university with credit through an exam, like AP, while closer to 40 percent are accepted with dual credit hours. Outside Texas, it can be harder to get colleges to accept dual credit hours if the school is unfamiliar with the college where the class was taken. When Brenda Ortiz was applying to college, she realized her dual credit classes wouldn’t transfer to schools in California. Brenda ended up going to Texas State in 2014, where she received the most financial aid. She says dual credit helped her start college as a sophomore, and she’s beginning her senior year this week. Texas State says it doesn’t track how many students are bringing dual credit hours with them when they enroll. But, they say, anecdotally, the number of students with dual credit hours is increasing.